At the conclusion of last week’s post about adventure studying, I asked students, who were so inclined, to share photographic evidence of their most adventurous expeditions. I wanted to take a moment to pass along one such story. Back in my senior year, I was about to have my finals exam in my Chinese class. I was having a lot of trouble studying for that exam; I felt like I needed a break, So I jumped at the chance to take a trip with friends to the nearest waterfall (about four hours away). This particular falls was three levels high. 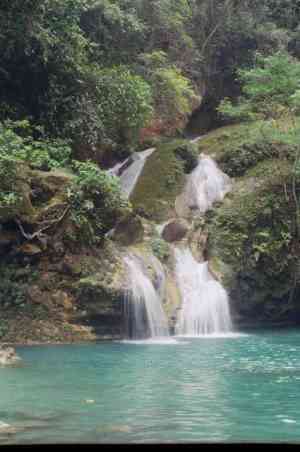 We climbed up the mountain and crossed a few streams to get to the source. I still remember how every bit of nature we passed seemed so interesting. Well, I struck a deal with my friends. I’d take care of their stuff under a crude cottage while they’d jump into the water. I got to make them happy, and get through a lot of material at the same time. The change of scenery was just what I needed to concentrate. The place was so peaceful; I didn’t feel any pressure to cram things in my head since I wasn’t surrounded by panicked students. I ended up getting a perfect grade on that exam. If you’re enjoying the type of sunny day I am here in Boston (I celebrated the end of a rainy stretch with a long run this afternoon), ask yourself: where could I be studying? I have, once again, entered one of those delightful busy periods that threatens to rip all of one’s best laid productivity plans into a pile of once good intentioned but now useless shreds. The reasons fit the standard litany: end of the semester work colliding with a random cluster of grad student-ey administrative work colliding with three trips in four weeks. 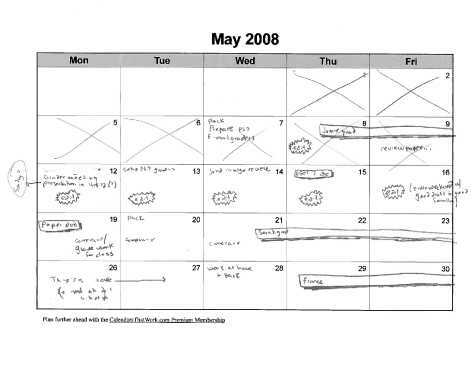 Most students follow a similar strategy to cope with this scenario: the panic schedule. The idea is simple: you list out everything that needs to get done during the crazy period and then make some attempt to come up with a schedule that covers the crunch. Sometimes, however, this mega-list approach fails to provide the desired salve to your aching productivity soul. You don’t trust it. You find yourself constantly reviewing what’s coming up and trying to re-convince yourself work will get done. Deadlines collapse into other deadlines. Too much work is squeezed into too tight spaces, and soon your days fall back into chaos. In this post I want to describe a simple variation to the panic schedule that helps me both plan busy periods and remain calm throughout. List out all the projects that need to get done during the hard period. Label each with its deadline. Estimate the number of work days needed for each project. Shuffle, edit, and tweak until you feel confident that no one day is unrealistically packed and everything has a place. Panic when you realize there is too much and you can’t satisfy (5). At this point start canceling and negotiating. Following the 4D method, you might start getting rid of obligations or re-negotiating different future dates for non-urgent tasks. Then go back to (5). I’ve included at the top of this post a scan of the visual panic schedule fueling my May. Notice the visual improvisation. I have stars around the editing work for my big research paper due next Monday (because not getting this done is a particular source of worry). In some places I added arrows. The big deadlines and travel dates have nice drop-shadows because, as everyone will admit, drop-shadows are awesome. Etc. The big picture idea here, however, is that I have taken a lot of work that has to get done in a short period of time, and then made the plan to handle it visual. A 10 second glance at the calendar reassures me that everything will get done and that the schedule makes sense. A long list containing the same elements would not provide the same relief. My mind sees a list and thinks: “This looks long, is this really going to happen?” And then it stresses. On the other hand, it sees this calendar and can say: “Oh, I edit today. Good. ” And then it relaxes. It’s a simple trick to improve a common strategy. And like the best simple tricks, its impact is significant. I’m leaving this afternoon for a three day trip. This means no Friday post and I might be a little slow moderating comments. In the meantime, I wanted to leave you with a few interesting articles that I found in some unexpected sources. The gray lady tackles the biology of habits and how to form new ones. A fascinating article about a scientist who figured out how to make humans into master memorizing machines — and was then, ironically, forgotten. I’ll probably deal with the specifics of this research in a later post, but definitely worth a read. (Hat Tip: Ramit). Ben recently posted some ideas from a conversation he and I have been waging over the past few weeks. I’m interested in your thoughts. More details will probably be forthcoming in later posts. I have my issues with the New Criterion crowd, but their writing is always quality and their ideas always, at the very least, provocative. This is an interesting essay from their recent education issue. It tackles the role of the classics in a liberal arts education. Food for thought when considering your own course of study. 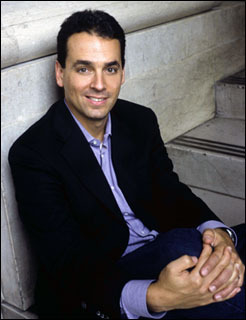 If you don’t know Daniel Pink, you should. His bestselling books, Free Agent Nation (2001) and A Whole New Mind (2005), heralded the arrival of the conceptual age. 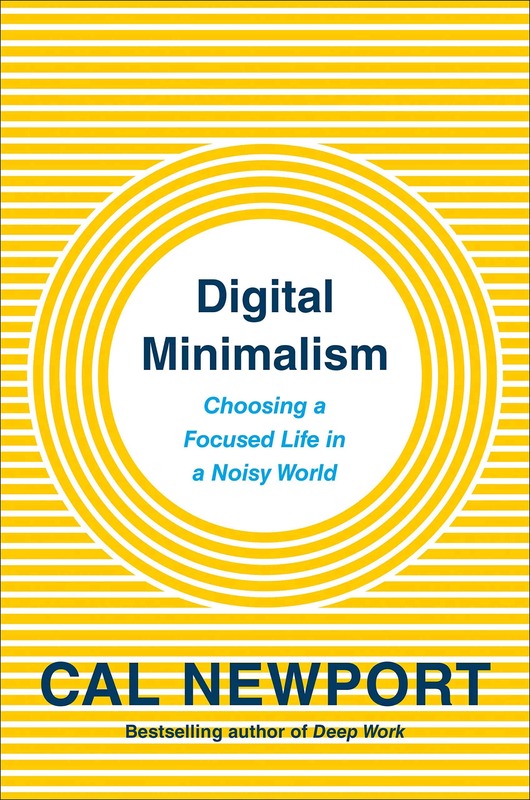 Dan has also written on issues of business and technology for The New York Times, Harvard Business Review, Fast Company, and Wired. His full biography reads like a Zen Valedictorian, post-grad adventure tale. He attends Yale Law School then never practices a day of law, deciding, instead, to bum a ride out to Washington. Soon he’s a vice-presidential speech writer. He leaves that job to write two of the most important business books of the last decade. He then wins a fellowship to move to Japan and study the Manga industry. As you can imagine, I was quick to get in touch with Dan. I asked him what advice he had for a current college student looking to jumpstart a Pink-esque career after graduation. He was kind enough to respond. Your own post-college path seems serendipitous. How did you stumble onto this path. And once on it, how did you keep moving in such an interesting direction? You’ve got it right. There was a lot of stumbling and serendipity. Since I knew I wasn’t going to practice law, I decided to go into what I then found most interesting: politics. I worked on a number of political campaigns as a policy and communications person — and then, yes, stumbled into speechwriting. What happened is that I wrote a few speeches. They weren’t awful. Then they asked me to write a few more and before I knew it, I was a speechwriter. I got reasonably good at it, did it for awhile, but then got sick of the b.s. of politics. At that point in my life, I was becoming deeply interested in business and technology — so I decided to go out on my own and write about those topics. All of the books and most of the articles I’ve written since then have really emerged from pursuing the things I was curious about. That’s a key. Curiosity. I tried to follow my curiosity and see where it took me. 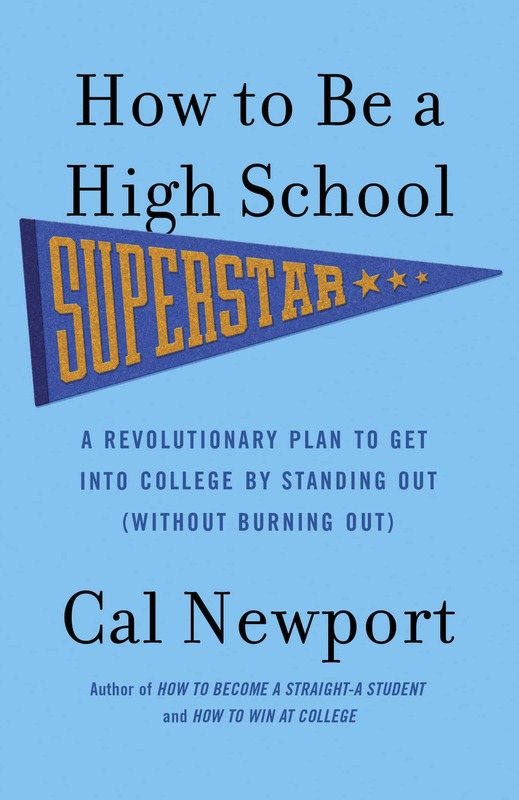 Also — and this is important — I decided that since so many people could outsmart me, nobody would outwork me. As you know, I’m a big believer that persistence trumps talent. What’s the biggest myth about the post-graduation search for a job that you would like to dispel? That you need to have a carefully articulated plan. Too many people make career decisions for instrumental reasons — because they think what they’re doing will lead to something else. Not enough people make decisions for fundamental reasons — because of the value of the activity itself. The dirty little secret is that instrumental reasons don’t work. It’s way too tumultuous out there. The people who really flourish are those who make decisions for fundamental reasons. They have to live with a certain amount of ambiguity about not knowing what’s going to happen next. But that keeps them alert to unexpected opportunities and the serendipity you talked about earlier. What lessons would you give to Johnny Bunko’s little brother who is, let’s say, a rising college sophomore? 1. Begin the process of discovering what you love to do and what you’re great at — what, in some sense, you are on this planet to do. You won’t necessarily find the answer in college. But asking that question will put you on a promising trajectory. 2. Pick the professor, not the course. In the hands of a good teacher, every topic can fascinating. 3. If you’re in the arts, take a laboratory science course. If you’re in science, take a studio art course. 4. Exercise. Seriously. Exercise is one of the few things in life that is uniformly, unequivocally good for you. The full effect is hard to describe. You lose your sense of height and location in space. Are you in a ship? In a building? Are you a few feet above the water or hundreds? Very Zen. My first thought: this would be a damn good place to work on a paper. Here’s my question: does it have to be like this? At Dartmouth, I frequently sought ways to challenge this conventional wisdom. When I would see the hooded sweat-shirted masses trudging toward the library at the beginning of finals period, I would turn and run in the opposite direction. I was known to drive 20 minutes away from campus to study at bookstore where no one knew or cared that my school had exams. I would sometimes tackle thorny take-home exam questions while walking the banks of the Connecticut river. Anything to avoid the cinder-blocked study lounges that most students believed — bafflingly — that they were contractually bound to inhabit during this period. I call this tactic: adventure studying. The basic idea is simple. Our minds crave novelty. If you work on exam preparation and paper writing in novel environments, it becomes easier to engage the material, be more creative, form stronger comprehension, and, overall, dare I say it, perhaps even enjoy the process. I’m embarrassed, however, that as an undergraduate I didn’t have the confidence to push adventure studying as far as I should have. I want you to make up for my shortcoming. I want you to push the adventure studying concept to its limits. What is the most outrageously exotic yet undeniably perfect location where you can migrate your exam preparation or final exam writing? Try it. 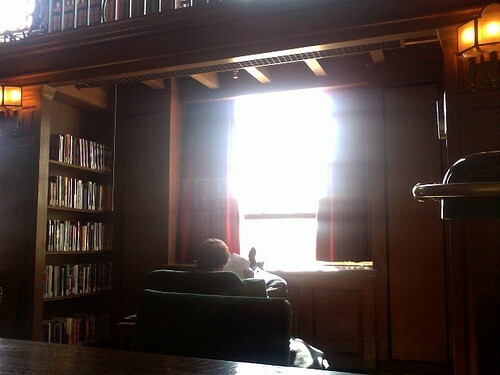 Ignore ingrained student traditions of camping out in libraries and study lounges. Redefine finals period to be a source of personal reflection and novelty and intellectual adventure. If you have a car, spend a day reviewing in a completely different town. Preferably one that is small, and idyllic, and more than 30 minutes from campus. Switch between little cafes, the public library, and parks. Meet the locals. If you’re near a body of water and live somewhere reasonably warm: spend a day reviewing in your bathing suit. Cycle through: reviewing; napping; swimming; then back to reviewing. I’ve never tried running through flashcards at the end of an ocean-battered jetty; but I imagine it’s not a bad way to learn those art history dates. Head to the nearest big city and camp out at museum. Find your own local equivalent of the ICA mediatheque room. Load up some quiz-and-recall study guides in your backpack and hike some place isolated and wild. Switch between studying and wandering and reading and zoning out in a Thoreau-esque state of blissfulness; like Into the Wild — but, hopefully, with less death. Who says you can’t review on a 5000 foot summit? It’s better than the library basement. 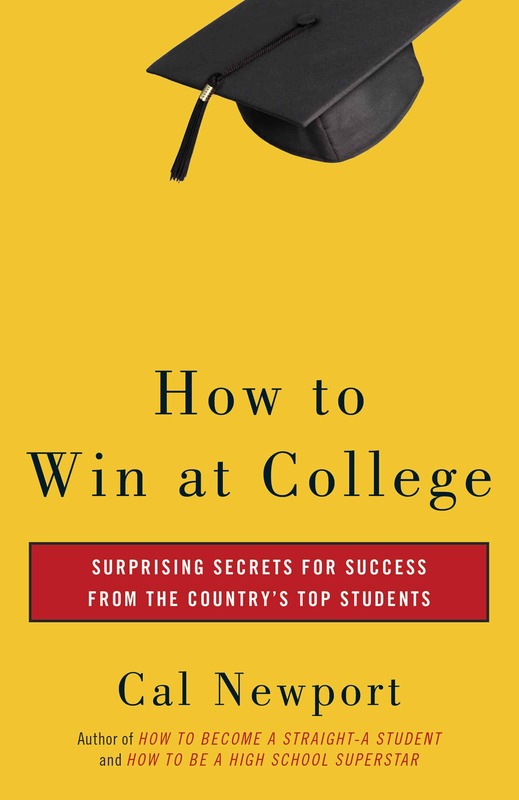 I’ll let you in on a critical secret: no one cares how or where you study. You don’t have to punch a time card when you enter the library. The dean doesn’t track how you spent your day. Take 100% advantage of this reality. Just because it’s “tradition” to spend the week before exams holed up in the library in some macho display of academic self-flagellation, this doesn’t mean that you have to follow this path. Why can’t you study alone on the beach? Or in your parent’s cabin in Maine? 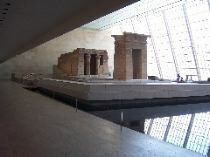 Or sitting on a bench near that crazy, completely enclosed Egyptian Tomb they have setup at the Met? You might have noticed that I tagged this article with “The Zen Valedictorian.” I think the adventure studying concept fits nicely with the ZV philosophy. 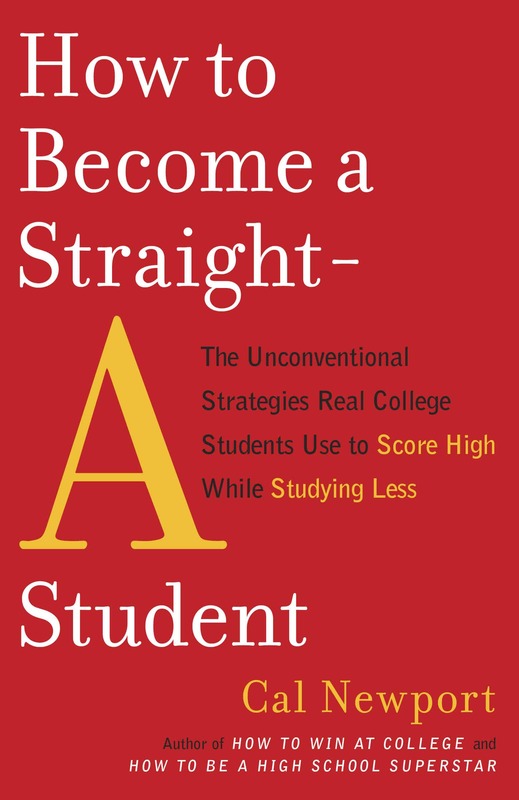 It’s about the larger goal of constructing the college experience you want, not stumbling through the path of least resistance. If you take up the adventure studying challenge — and I hope you do — keep me posted. We want to hear about your adventures. I’ll share the best with the full gang. Bonus points for pictures.